During the great battle of Trafalgar, fought on October 21, 1805, the French 74 gun ship of the line Redoutable engaged the British 100 gun warships Victory and Temeraire, nearly capturing Nelson’s own flagship (HMS Victory) before being beaten by the combined firepower of the British ships. The Redoutable’s stout performance during the battle resulted in the death of Admiral Nelson himself, and the damaging of two of the Royal Navy’s three-decker ships of the line. Redoutable’s Captain Jean Jacques Etienne Lucas was personally awarded the gold cross of the legion of honor by Napoleon in recognition of his ship’s service. The report below was written by Captain Lucas after the battle as part of his report to the naval ministry, and represents one of several reports written by Lucas regarding the battle. A few points which should be clarified include the following: (1) According to British eyewitnesses, Victory ceased firing at two points in the engagement not because her guns had been silenced but because of a false belief that Redoutable was surrendering (she was not). Lucas apparently mistook these pauses in firing as silencing of his enemy’s guns. (2) The involvement of the French warship Fougueux seems to have been somewhat different than Lucas understood at the time of his report. In reality Fougueux was attempting to come to Redoutable’s aid when it fouled Temeraire and was dismasted during that engagement. Made to his Excellency the Minister of Marine and of the Colonies, by M. Lucas, naval captain, officer of the Legion of Honour, on the sea battle of Trafalgar between the combined fleet of France and Spain under the orders of Admirals Villeneuve and Gravina and the English fleet commanded by Admiral Nelson ; and particularly on the combat between the Victory of 110 guns with the flag of Admiral Nelson, the Temeraire of the same force and another ship, a two decker, and the Redoutable, of which His Majesty had entrusted me with the command. 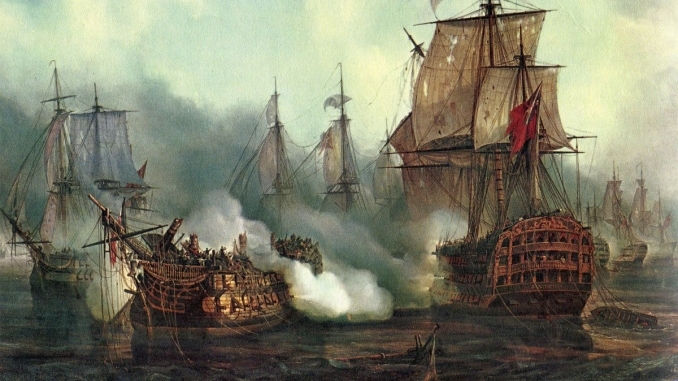 Although the loss of the Redoutable forms a part of the defeat undergone by the Combined Fleets of France and Spain in the sanguinary battle off Cape Trafalgar, the part taken by this particular ship, all the same, deserves a distinguished place by itself in the annals of the French Navy. In consequence I owe it to the memory of the brave men who fell in the terrible fight, or went down in the remains of the Redoutable when she sank, I owe it also to the glory of the small band of those who survived that inexpressible slaughter, to bring under the notice of your Excellency a picture of their exploits, the efforts of their valour, and above all the expressions of their love for, and attachment to, His Imperial and Royal Majesty, whose name, repeated a thousand times with the utmost enthusiasm, seemed to render them invincible. Nothing could equal the ardour of such heroes at the moment that I announced to them that we were going to board the English flagship; and not even the intrepid Nelson himself could have died more nobly than in combating enemies so worthy of his courage and of his grand reputation. I will not undertake here to explain the movements of the two fleets during the whole of the action. Surrounded myself with fire and smoke, I was only able at intervals to discern the ships in my immediate neighbourhood. . . . But I will enter into all the details of what took place on board the Redoutable during the contest that my ship went through at the cannon’s mouth and, broadside to broadside with a ship of a hundred and ten guns, the Temeraire of the same force, and a third ship, a two-decker, of which I do not know the name. The enemy’s column, which was directed against our centre, was at eleven o’clock on the port side, and the flagship Bucentaure began firing. I ordered a number of the captains of the guns to go up on the forecastle and observe why it was some of our ships fired badly. They found that all their shots carried too low and fell short. I then gave orders to aim for dismasting, and above all to aim straight. At a quarter to twelve the Redoutable opened fire with a shot from the first gun division. It cut through the foretopsail yard of the Victory, whereupon cheers and shouts resounded all over the ship. Our firing was well kept up, and in less than ten minutes the British flagship had lost her mizen-mast, foretopsail, and main . Meanwhile I always kept so close to the Bucentaure that several times they called to me from their stern gallery that I should run them down; indeed, the of the Redoutable touched the crown of the flagship’s taffrail; but I assured them they had nothing to be anxious about. 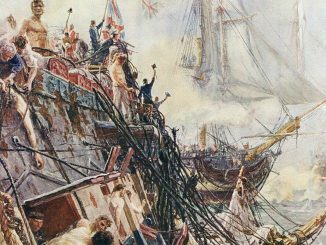 The damage done to the Victory did not affect the daring manoeuvre of Admiral Nelson. He repeatedly persisted in trying to break the line in front of the Redoutable, and threatening to run us down if we opposed. But the proximity of the British flagship, though closely followed by the Temeraire, instead of intimidating my intrepid crew, only increased their ardour; and to show the English admiral that we did not fear his fouling us, I had grappling irons made fast at all the yardarms. The Victory having now succeeded in passing astern of the French admiral, ran foul of us, dropping alongside and sheering off aft in such a way that our poop lay alongside her . From this position the grappling irons were thrown on board her. Those at the stem parted, but those forward held on; and at the same time our broadside was discharged, resulting in a terrible slaughter. We continued to fire for some time, although there was some delay at the guns. We had to use rope rammers in several cases, and fire with the guns run in, being unable to bowse them, as the ports were masked by the sides of the Victory. At the same time, elsewhere, by means of muskets fired through the ports into those of the Victory, we prevented the enemy from loading their guns, and before long they stopped firing on us altogether. What a day of glory for the Redoutable if she had had to fight only with the Victory! The English batteries, not being able to resist us longer, ceased firing (les batteries du Victoire ne pouvaient plus nous riposter). Then I became aware that the crew of the enemy were about to attempt to board us. At once I had the trumpets sounded, giving the divisional call for boarding. All hastened up from below instantly, in fine style; the officers and midshipmen sprang to the head of their men, as though at a parade. In less than a minute our decks swarmed with armed men, who spread themselves with rapidity on the poop and in the nettings and the shrouds. It would be impossible to say who was the foremost. Then a heavy fire of musketry opened, in which Admiral Nelson fought at the head of his crew. Our firing, though, became so rapid, and was so much superior to his, that in less than a quarter of an hour we had silenced that of the Victory altogether. More than two hundred grenades were flung on board her, with the utmost success; her decks were strewn with the dead and wounded. Admiral Nelson was killed by the firing of our musketry. Immediately after this, the upper deck of the Victory became deserted, and she again ceased firing, but it proved difficult to board her because of the motion of the two vessels, and the height of the Victory’supper tier and battery. On that I gave the order to cut the supports of the main-yard so that it might serve as a bridge. At the same time Midshipman Yon and four seamen sprang on board the Victory by means of her anchor, and we then knew that there was nobody left in the batteries. At that moment, when my brave fellows were hastening to follow, the three-decker Temeraire, which had seen that the Victory fought no longer and must without fail be taken (allait infailliblement entre pris), came down, full sail, on our starboard side. We were immediately under the full fire of her artillery, discharged almost with muzzles touching. It is impossible to describe the carnage produced by the murderous broadside of this ship. More than two hundred of our brave men were killed or wounded by it. I was wounded also at the same time, but not so seriously as to make me abandon my post. Not being able to undertake anything on the side of the Victory, I now ordered the rest of the crew to man the batteries on the other side and fire at the Temeraire with what guns the collision when she came alongside had not dismounted. The Victory by this time fought no longer. She busied herself only with getting clear of the Redoutable. We, however, meanwhile, were being cut to pieces by the cross fire from the Temeraire, with whom we still fought, and from the other ship, which was still firing into us at the stern. Unable to meet that fire, and not seeing any chance of rescue, the rest of our ships being all too far to leeward to be able to come to our assistance, I hesitated no longer about surrendering. The leaks were sufficiently serious to ensure the ship going to the bottom, so that the enemy would not keep her. When I satisfied myself finally about this, I gave orders to lower the colours. The flag, however, came down by itself with the fall of the mizen-mast.’ We were then left by the ship which had been firing into us astern, but the Temeraire continued to fire on us. She did not give over until her men were obliged to do so by having to work at extinguishing a fire which had broken out on board their own ship. It was then half-past two in the afternoon. The Victory, the Redoutable, with the Temeraire and the Mercure [sic], were all the time joined together, owing to their masts having fallen across from one ship to the other. Unable to use their helms, they formed one mass, which drifted at the mercy of the wind. In that way they came foul of the Fougueux, which, having fought against several of the enemy’s ships, had been left by them without having lowered her flag. She was dismasted and unrigged, and floating an unmanageable hulk. On fouling the group of ships she was boarded by the Temeraire. The Fougueux was, however, beyond making serious resistance. Her brave captain, Baudouin, though, even then made an effort, but in vain. He was killed at the outset, and his second in command was wounded at the same moment; whereupon some men of the Temeraire sprang on board and took possession. The enemy took no steps to take possession of the Redoutable, in which the leaks were so considerable that I feared the ship would sink before they would be able to get the wounded out. I represented the state of things to the Temeraire, and warned them that unless they took steps at once to send men on board with gear for the pumps and give us immediate succour, I would have to set fire to the ship, which would involve the Temeraire and the Victory. Immediately after that two officers and some seamen and marines came on board and took possession of the ship. One of the English marines, who entered on the lower deck through a port, was attacked by one of our wounded sailors armed with a musket and bayonet. He fell on the Englishman with fury, shouting, ‘I must kill one more of them!’ He bayoneted the marine through the thigh, and the man fell between the two vessels. In spite of this incident, however, I was able to induce the English party to remain on board. They wanted to return to their own ship and leave us. Towards three o’clock some of the ships of our van squadron which were to windward on the starboard tack and apparently about to draw off from the battle, without having been perceptibly damaged, fired several shots at our group, but from a long range. Several of their cannon balls fell on board the Redoutable, and one of the English officers had his thigh shattered and died in a few moments. At half-past three, the Victory separated herself from the Redoutable, but she was in so dismantled a state as to be hors de combat.’ It was not until seven in the evening that they were able to get the Redoutable clear of the Temeraire, which still, however, remained foul of the Fougueux. We had not yet been formally taken possession of, but the English Swiftsurenow arrived and took us in tow. We spent the whole of that night at the two pumps which were all that remained workable, without, however, being able to keep the water under. The few Frenchmen who were able to do duty joined with the English party on board in pumping, stopped several leaks, blocked up the port holes and boarded in the poop of the ship, which was ready to cave in. Indeed, no toil was too hard for them. In the middle of all the turmoil and horrible disorder on board, just keeping the ship above water, with the ‘tween-decks and batteries encumbered with dead, I noticed some of my brave fellows, particularly the young midshipmen, of whom several were wounded, picking up arms which they hid on the lower deck, with the intention, as they said, of retaking the ship. Never were so many traits of intrepidity, of valour and daring, displayed on board a single ship ; the whole history of our navy can show nothing like them. Next morning the captain of the Swiftsure sent a boat to take me on board, together with Lieutenant Dupotet and Midshipman Ducrest, and we were duly conducted there. At noon the Redoutable lost her foremast, the only mast she had left. At five in the evening the water continued so to gain on the pumps that the prizemaster made signals of distress, and all the boats of the Swiftsure were lowered to rescue the crew. It was blowing very hard at the time, and the sea ran very high, which made the getting out of the wounded very difficult. These poor fellows, on its being seen that the ship was going down, were nearly all brought up and laid on the . They were able to save several of them. At seven in the evening the poop was entirely submerged. The Redoutable sank with a large number of the wounded still on board. They met their death with courage worthy of a better fate. A hundred and sixty-nine men, forming the remainder of the brave crew of the Redoutable, found themselves together on board the English ship. Seventy of the number were badly wounded and sixty-four of the rest had less serious wounds. 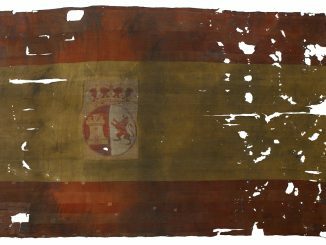 All the wounded were sent into Cadiz under a flag of truce, and in the end only thirty-five men from the Redoutable were taken to England as prisoners of war. The results of the battle as regarded the Redoutable were these: the loss of the ship and destruction of threequarters of her crew. On the other hand, single-handed, she had throughout the battle engaged the attention of two three-deckers, the Victory and Temeraire; and in this way had fully occupied Admiral Nelson himself, who, taken up with this one encounter, could only free himself by excessive daring. England has lost the hero of her navy, who fell before the brave men of the Redoutable. More than three hundred men, several of them superior officers, were put hors de combat on board the enemy’s ships. The Victory lost her mizen topmast in the action and main ; and in general all her yards were badly damaged and also the wheel. The Temeraire lost two of her topmasts; two lower yards, and her helm and rudder were destroyed by the guns of our upper deck. Both ships had to return to England to undergo large repairs. I add to this report a return of the ship’s company of the Redoutable, both before and after the battle. It will show you the loss of men of each class. I also add a list of the officers by name, both of the etat Major and the midshipmen. The praise and commendation due from me to one and all are beyond expression. No one who did not see the valour of the officers and young midshipmen told off to lead our boarding parties can form an idea of their ebullient ardour, their splendid audacity-especially when, at the head of the brave men that each commanded, they stood in front of the boarding-nettings, armed some with pistols and cutlasses, others with carbines, all directing the fire of the musketry and the flinging of the grenades. 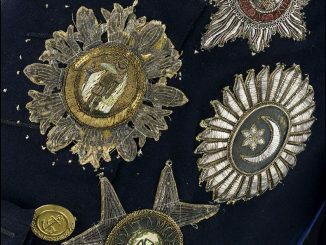 In this, the officers of infantry and those of the ship, the sailors and soldiers alike, all displayed unsurpassable courage, and in presenting my list of them it is impossible to name which were the most meritorious. Monseigneur, I have the honour to be your Excellency’s most humble and obedient servant. Captain Commandant of the Redoutable. Courtesy of the War Times Journal.